mySalesforce was previously known as the Salesforce1 mobile app, a mobile development application tool that was rebranded. 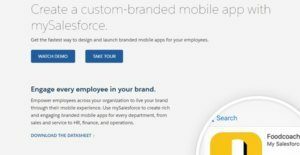 In late 2017 the product was introduced together with other new “my” tools – myLightning, myEinstein, and myTrailhead – to further empower Salesforce users. Specifically, mySalesforce allows you to make your own mobile platforms, from customized apps to branded dashboards, for use by your company employees. The purpose is to extend your brand among your employees, enhance their customer experience, and improve brand loyalty across your organization. Two primary components make up mySalesforce: the Lightning App Builder and the Listing Wizard. The former gives you an easy drag-and-drop functionality to configure an array of elements that comprises your app such as dashboards, menus, task managers and calendars. All of these elements can be custom-branded with your corporate name, logo or theme. Meanwhile, the Listings Wizard provides step-by-step instructions, testing as well as configuration to facilitate approval and publishing of your apps at the Google and Apple app Store. Customer loyalty is built and maintained from the branding you consistently sustain and enforce. This can be undertaken with your employees by providing them branded apps to enhance their mobile experience. You can create apps for use by specific departments in your organization such as HR, sales, finance, operations and others with particular functions, all the while carrying your custom branding elements such as company color, name or logo. The Salesforce platform is widely considered as the leading low-code mobile development platform. mySalesforce lets you easily create feature-rich and engaging apps through the Lightning App Builder, which provides a drag-and-drop library of configurable components. These components are what make up your app – dashboards, menu, tasks, etc. You won’t need complicated coding and deep technical expertise to build your own company-centric apps. Having your apps listed at the App Store and Google Play normally takes months. You can accelerate the process with mySalesforce’s listing wizard, which gives you detailed instructions on the publishing process, including testing and configuring the app before submitting it for approval. It lets you pinpoint typical issues that get apps rejected such as user interface errors and broken links. Having these cleared out before submission will likely take you just weeks for approval and avert what every app maker dreads – the rejection and relist cycle. You can update your app as often as you want and immediately push it out to your users. In addition, mySalesforce gives you three automatic upgrades every year without breaking your customizations. This lets you regularly your employees’ mobile experience while engaging them with your brand and allowing your to customize the mobile app to drive adoption. What Problems Will mySalesforce Solve? Problem 1: Low employee engagement. Your employees may be looking or are actually using external mobile apps for their work but may feel less engaged with apps that have limited functionality or are not designed for particular functional needs of your company. You can now easily build your own company-centric apps, with no complex coding required, that can be as feature filled, customizable, and company branded to engage your employees. Problem 2: It takes you months to have your apps published. The App Store and Google Play reject any app that does not conform to their strict standards which is why it may take months of the reject-and-relist cycle before your app finally makes it to the store pages. So before submitting your apps you have to make sure they are of the highest quality free of problems. mySalesforce offers a listing wizard that runs you through the details of publishing your app and giving you tools to test and configure the app so that it is devoid of issues when your submit it. Problem 3: Reinforce your brand through your apps. If you are considering mySalesforce it could also be sensible to analyze other subcategories of Best Application Development Software listed in our database of SaaS software reviews. It is essential to keep in mind that almost no service in the Application Development Software category is going to be a perfect solution that can fulfill all the needs of all business types, sizes and industries. It may be a good idea to read a few mySalesforce reviews first as specific software can dominate exclusively in a really small group of applications or be prepared with a very specific type of industry in mind. Others can work with an idea of being easy and intuitive and consequently lack complicated features welcomed by more experienced users. You can also come across solutions that support a wide group of users and provide a rich feature toolbox, however that in most cases comes at a more significant cost of such a software. Ensure you're aware of your requirements so that you buy a software that offers exactly the features you search for. How Much Does mySalesforce Cost? mySalesforce, together with the other “my” tools, are add-on products under the Salesforce Lightning packages that include the Starter plan at $25/ser/month, Platform Plus at $100/user/month, and Platform Unlimited with custom pricing. You can contact the vendor for pricing details or to request a quote. We realize that when you make a decision to buy Application Development Software it’s important not only to see how experts evaluate it in their reviews, but also to find out if the real people and companies that buy it are actually satisfied with the product. That’s why we’ve created our behavior-based Customer Satisfaction Algorithm™ that gathers customer reviews, comments and mySalesforce reviews across a wide range of social media sites. The data is then presented in an easy to digest form showing how many people had positive and negative experience with mySalesforce. With that information at hand you should be equipped to make an informed buying decision that you won’t regret. What are mySalesforce pricing details? What integrations are available for mySalesforce? There is no specific information on integration. However, some Salesforce apps are known to be inter-operable with other products in the Salesforce suite. But with hundreds of products in the Salesforce Cloud, Services, Platform, and Lightning ecosystem, it is best to consult the vendor on particular internal as well as external apps integration. If you need more information about mySalesforce or you simply have a question let us know what you need and we’ll forward your request directly to the vendor.